The Spinning Meals recipe and meal planner app is the ultimate time saver for busy families, automatically creating a meal plan and shopping list based on user’s existing recipes and preferences. 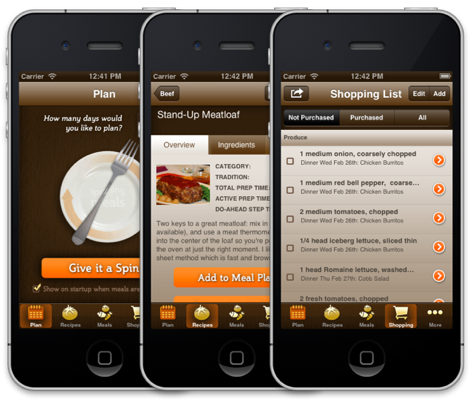 Polanco Media was contracted to build a data-intensive meal planning app using the client’s patent-pending formula. After over 10 months of development, Spinning Meals was launched and is currently the only iPhone app that automatically plans a weekly meal scheduled, based on the user’s own recipes and meal preferences. The app makes heavy use of native SQLITE relational database support, using a custom object relational mapping library to support dozens of complex relational queries. On top of the data layer, the app is build with Appcelerator Titanium, making use of native iOS controls to provide the user with a native interface. Polanco Media implemented the custom UI created by the client’s design team to match the product’s branding and design. Custom backend API was built with Node.js to support advanced recipe search capabilities. 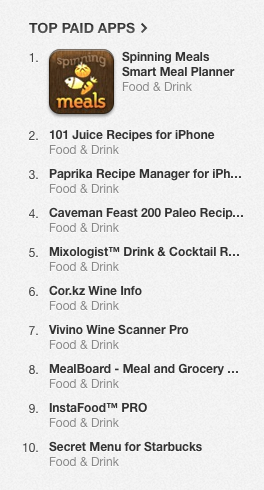 The Spinning Meals app reached #1 on the App Store for Food & Drink category, surpassing our wildest expectations for the app. We are very proud of this accomplishment!